According to the IBM Institute for Business Value the market will see a rapid adoption of initial cognitive systems. The most likely candidates have moved beyond descriptive and diagnostic, predictive and routine industry-specific capabilities. Seventy percent of survey respondents are currently using advanced programmatic analytics in three or more departments. In fact, the widespread adoption of cognitive systems and artificial intelligence (AI) across various industries is expected to drive worldwide revenues from nearly US$8.0 billion in 2016 to more than US$47 billion in 2020. The analyst firm IDC predictsthat the banking, retail, healthcare and discrete manufacturing industries will generate more than 50% of all worldwide cognitive/ AI revenues in 2016. Banking and retail will each deliver nearly US$1.5 billion, while healthcare and discrete manufacturing will deliver the greatest revenue growth over the 2016-2020 forecast period, with CAGRs of 69.3% and 61.4%, respectively. Education and process manufacturing will also experience significant growth over the forecast period. Figure 1: Credit Cognitive Scale Inc.
1. DeepMind from Google that can mirror some of the brain's short-term memory properties. This computer is built with a neural network capable of interacting with external memory. DeepMind can "remember" using this external memory and use it to understand new information and perform tasks beyond what it was programmed to do. The brain-like abilities of DeepMind mean that analysts can rely on commands and information, which the program can compare with past data queries and respond to without constant oversight. 2. IBM Watson which has a built-in natural language processor and hypothesis generator that it uses to perform evaluations and accomplish dynamic learning. This system is a lot more advanced than the digital assistants on our smartphones and allows users to ask questions in plain language, which Watson then translates into data language for querying. Leverage software applications that should be developed using ISO 27034 which is a multi-part standard on specifying, designing/selecting and implementing information security controls through a set of processes integrated throughout an organization's Systems Development Life Cycle/s (SDLC). Companies that are leveraging cloud today must also prepare for the cognitive computing era. This blend of cloud and cognitive has, in fact, created a brand new application development model. Referred to as "Cognitive on cloud", this model delivers cognitive services running in the cloud that are consumable via representational state transfer (REST) APIs. These services are available as part of platform-as-a-service (PaaS) offerings such as Bluemix and can be easily bound to an application while coding. Using this approach, cognitive analytics such as voice (tone analyzer, speech-to-text) and video (face detection, visual recognition) capabilities enables quick analysis of petabytes of unstructured data. Developing cognitive applications to run on mobile devices has provided new insights which help organizations create totally new revenue streams. When selecting a cloud service provider however cognitive on cloud ROI requires more than just a total cost of ownership comparison. 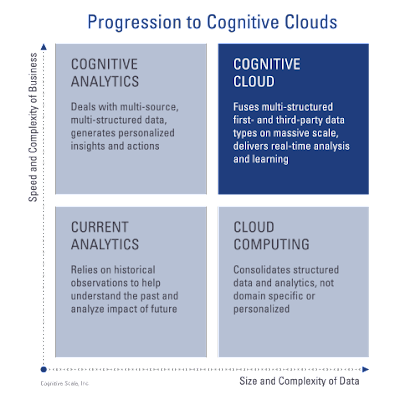 In addition to this basic analysis, an organization must consider which cloud is cognitive enabled at the Platform-as-a-Service (PaaS) layer. The convergence of cognitive computing and cloud is driving this cognitive-oriented digital economy and the potential return is seemingly unlimited.